A few of the bottles seem to have organized a revolt and thrown off their labels! That is some cellar you have there, Mr. English. You could hunker down for weeks there! Hello Mark. My name's Ben, from Bristol - I'm in the process of converting an old coal cellar into a wine cellar - yours looks great! What year house is it? Any more wine cellar related piccies would be appreciated. Built between the 1851 census and the 1861 census is as close as we can get. 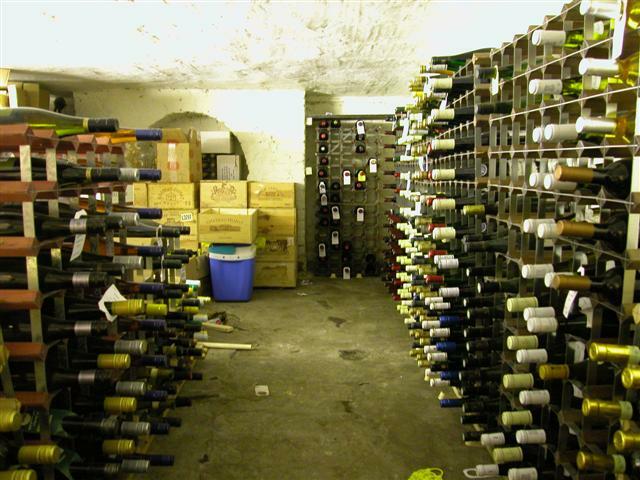 See http://www.mmenterprises.co.uk/blog/2007/02/vinosafe-walk-in-wine-cellar-storage.htm - for what we used in the garage of our previous house. It saved us having to move at a time when we wanted to stay put but we desparately short of storage - the cost of the vinosafe was cheaper than moving house! The wine racks we got from Majestic. I have a few more pictures but they basically look the same as the one you commented on.